I’m away from the computer for a couple of days, but have auto-posted some hat shop photos. You can see a few different styles here (notice the bottom row). As you’d expect, Lancaster County is home to a couple of hat shops as well. That’s it for today. If you like, you can read more on why Amish wear Plain clothing. Nice pictures and very interesting on the hats. I guess I never realized or paid attention before to the various styles. I’m wondering why Amish ladies use straight pins to hold clothing closed instead of safety pins or buttons. Seems like the straight pins would be dangerous to them and anyone who hugged them. We were having a discussion last night concerning Plain hats. Quakers (the Plain ones) often wear the same style, but the beautiful Amish wool felt ones are quite expensive, and therefore are an investment! I buy a less expensive hat for my husband, as he is unkind to his headgear – it gets a lot of work. In Ontario, the TSC stores (farm and garden) carry the straw hats in season, particulary in the Amish/Mennonite areas. I now buy Nicholas a straw hat for day wear, and a “good” hat for Sundays. I had no idea there were that many styles of hats for the plain people. Does anyone know if the local Ordung of a specific community dictates what style of hat a member of that community may wear? Also, can Erik or someone else that would be familiar with the issue tell me if the Amish wear different style or different color hats for different occasions? When I was a child many men still wore hats routinely and my dad probably had three different styles (and quality) of hats that he wore depending on what he was going to be doing or where he was going. He had a “work “ hat for doing serious outdoors work, an “everyday” hat that he wore to his job and he also had a “dress” hat that he would wear to “occasions”; weddings, funerals, social events, etc. Of course, he immediately took the hat off once he got inside wherever he was going, but it was his custom to wear one TO the event. He also had darker and lighter shades of the exact same style hat depending on if it was summer or not; nearly white hats were for summer wear while darker ones were for after Labor Day. I was just curious if any of the Amish groups do something similar or even make any distinction in why they wear a specific style hat versus some other style? In the photo from the Clymer, NY community you can see pads that clip inside the collars that are used with work horse harness hanging along the back wall directly behind the hats. There are some other things to the left and kind of in the corner that I can’t quite make out. Any thoughts on what they may be? I have been to Clymer, NY numerous times because the company I use to work for had a facility there, but it has been about 20 to 25 years since I was last there. I don’t think there were any Amish in the area at that time, but it could be that there were and I just didn’t know it. Does anyone know which direction the Amish community is from the town of Clymer? I bought a straw hat from an Amish lady who makes hats for the Swartzentruber community in Oswego County, New York. She sells them from her home; I’m not sure this qualifies as a full-fledged hat shop. I have also seen straw hats for sale at the Spector’s stores in Ohio and the Kidron Town and Country Store in Kidron, Ohio. These wide brim hats are great for protection from the sun while doing outdoor work. If the purpose is to observe headcovering and to do so within the concept of simplicity (not being ostentatious), then I don’t think for those who adhere to “plainness and simplicity” but who are NOT part of a group with a specific dress code that an exact style of hat, bonnet or cap/kapp is necessary. A simple triangle scarf fits the bill for females as long as they are not part of a group that specifies a particular cap/kapp. Do we contradict the concept of simplicity when we make the issue of clothing more complicated than it needs to be? 😎 Just a thought I’ve been pondering. One can dress simply and modestly without adhering to a rigid dress code as long as one does not belong to a group that has such a requirement. I am not sure what the objection would be to safety pins versus straight pins but the reason for no use of buttons or snaps is the buttons and snaps could get a bit too fancy. It could cause a sort of competition between the ladies to get the fanciest ones. That of course would go against the vanity rules of the ordnung. And it could cause problems within the community aspect of being Amish. I know that can seem strange to most Englishers or outsiders as it were, but basically I believe the Amish want to prevent temptation as much as possible as one thing could lead to another. Hope that answers your question a little bit. I think for the Amish in particular it goes beyond plain and simple with their “dress code” for a lot of reasons. But mainly by having a specific dress code such as style of kapp, hat, dress etc. it eliminates a feeling of competition. For example if the Amish allowed printed material for dresses, then human nature might take over and each woman would want the fanciest material for that dress. Which then could lead to jealousy and coveting. Both are considered sinful. I believe the Amish try very hard to prevent sins from happening. So, to me, I don’t think it is a contradiction or complicated for them. Old Kat, I do beleive each community’s ordnung does specify style of hat, brim width, that sort of thing as well as head coverings for women and clothing. Seems to me I read that on another post here a while back regarding dressing plainly. I am not sure if there are different hats for different occasions but I would imagine they have a different hat for work versus “occasions”. I am not sure what those other items are hanging back there either. Sure hope someone knows. Thanks for the feedback, Alice Aber. Sorry, but I can’t for the life of me understand the reasoning behind the poor Amish women having to use straight pins to hold their clothing together! I mean, come on, the ordnung can just specify that , say, they must all use plain black #7 snaps, and that would take care of that! I love, admire, and respect the Amish just like the rest of you do, but have to admit some of their ways and differing rules can get downright silly, like for instance, how many pleats can be in a woman’s kapp; how many and in what direction a man can wear his suspenders; and the topic of today, the many different types of hats! It’s all interesting to see for you and me, but to them it’s really a serious matter and that’s the part I don’t get. I understand the need to adhere to certain rules and all look alike in order to avoid things such as vanity, jealousy, and coveting, but to be so serious about such minute details – do they think God will favor the use of straight pins over plain snaps, or that a wider brim on the hat will be more pleasing to Him than a shorter one? Karen & Debbie, I tend to agree that straightpins do seem “dangerous”! However, in my “readings” (non-fiction, fiction, this blog…), I know I read somewhere that the “no buttons” rule had something to do with looking too much like the military (this was back in Europe). What I was wondering just last night, is, do the Amish use velcro? I know, it might seem “modern”, but wasn’t it modeled after Mother Nature’s/God’s own “design” of plants, like nettles (?) or other “stick-’ems” that grab onto your clothing and you have to “pick off”? Can anyone tell me if any Amish sects allow velcro to be used in clothing? And men are allowed (?) to do up their britches with hooks & eyes—why not women (to be separate from them?)? Then, how about the sexes “trade”, and let the MEN use straightpins? I guarantee that 1. either they’d switch back to hooks & eyes REAL fast, (let the women use the pins) or 2. women would be allowed to use hooks & eyes, too. What made me smile about the “hat shop” photos was that sign indicating no hat cleaning in November, traditional Amish wedding month. Fair warning, huh? Thanks for the info re: men allowed to use hooks & eyes. Like many others, I have often wondered how the closed their britches. If the men use hook & eyes fasteners, the women should be allowed to as well since the Bible teaches that a man is to love his bride as Christ Jesus loves his Church. That’s my two cents for this post. No problem OldKat, I hope it helped some. Debbie, to you its silly but to the Amish who live by the ordnung it is not. I like the hats, if i ever come to one such store I will buy one for R just for fun. As with anything concerning Amish and their lifestyles and choices it is all based on the biblical virtues of simplicity, modesty and humility, as well as nonconformity to the world, which are then dictated by a list of written or oral rules in the Ordnung but can change ever so slighty from church district to church district. The width of the brim and hat band and the height and shape of the crown are variables which gauge the orthodoxy of the group and individual wearer. Same gos for pins and pleats ,etc on womens dresses. Good point Betsey. But just wondering…couldn’t pride go in the opposite direction instead of fancy, couldn’t one compete to be the most austere? And wouldn’t that to some degree explain the various levels of technology and modesty in the Amish community? Betsy, you make an interesting point. I attended Loyola University in Chicago, and there was a large Muslim student body. The girls all dressed very modestly, but their clothes were very modern…for example, jeans with a higher waist (or long shirts to cover). If they wore tank tops they would wear long sleeved t-shirts with higher collars underneath. Their veils were extremely decorative scarfs. On the other hand we had a Muslim girl who wore a full black burqa with a sheer veil that completely covered her face. It’s just interesting how modesty can be interepeted by one group/belief system…quite the range! If you google “modest apparel” you will find several listings for Headcoverings and mens hats as well as clothes. You will also find patterns. I beleive candleonthehill.com sells both patterns and completed ones that they have made. I went hat-shopping today and to my surprise I found a hat at H&M looking very much like to one closest to the camera on the third shelf counting from the bottom in the first picture… I didn’t buy it though, I looked to masculine in it. Funny though. FYI, among the plain people, Amish, Mennonites, Brethren & Hutterites, the ordnung dictates the style of women’s headcoverings, the style of mens’ hats, the style and cut of your clothing, as well as colors or prints of material that may or may not be used. Is there a phone number or address for the hat shop in Nappanee? I am looking for hat styles sold under the “Amish” description, but not the traditional style–similar to those on the middle row in the top picture. 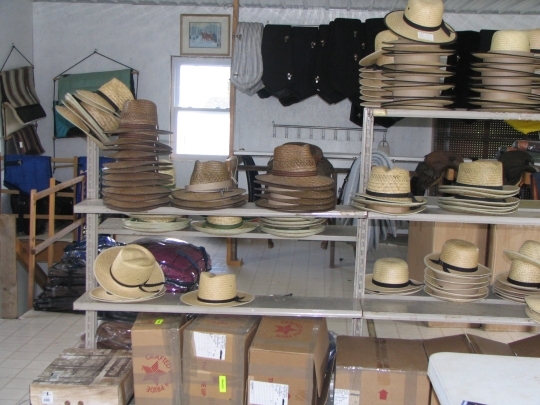 Pickens General Store in Heuvelton, NY also sells amish straw hats and amish hats for children. Many amish products can be seen on their website as well at www.pickensgeneral.org. 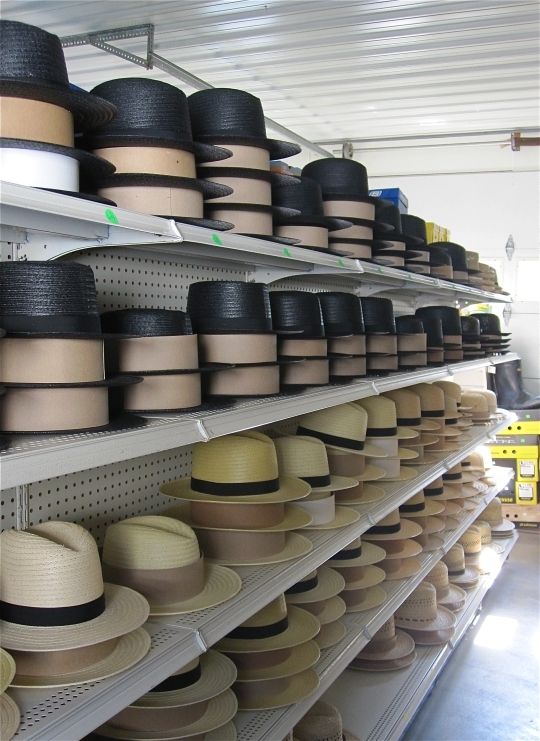 I am trying to find a particular hat in the photograph above that shows many hats in the Nappanee, Indiana Amish store. How can I reach the store or see the individual hats so that I can buy one. It is on the bottom row in the middle and is vented. It is number 6 from the left or 3 from the right. Thanks for any help. Have not been able to find this great work hat. One place to buy them is at Gohn Brothers in Middlebury,In. They also specialize in other Amish clothing as well. They are located in downtown. Can’t miss it. This is owned by none Amish. They might even have a web site. Growing up Amish in the 60’s in the Clinton District Southwest of Middlebury,In., we wore pinched hats in the front and a fairly narrow brim. Now they have went to huge round wide brims. They have actualy gone backward not forward in hat wearing. I would love to buy some Amish Hats. Man and Woman. I live in China. China people really like the Amish people in America. Can we become friends, and hope to do some business to send me some hats to China. Please contact me. Here’s what I did: go to http://www.nappaneechamber.com/NapChamberBrochure.pdf; find Burkholder Country Store or JC Fabrics & General Store; print the picture above with your hat choice circled; Mail to each store with hat size. They will respond with price/shipping. One caution: My hat arrived with a size label that wasn’t meant for the hat, thus it is a size too small. I have to stretch it to make it fit. Under the inside band I found a small sticker with the correct size–sure enough, it was a smaller size. Ask the store to check under the band to make sure. Return shipping cost more than a hat stretcher. Otherwise a great purchase, friendly folks and a great hat. I customized it to make it more “English” by changing the outer band. 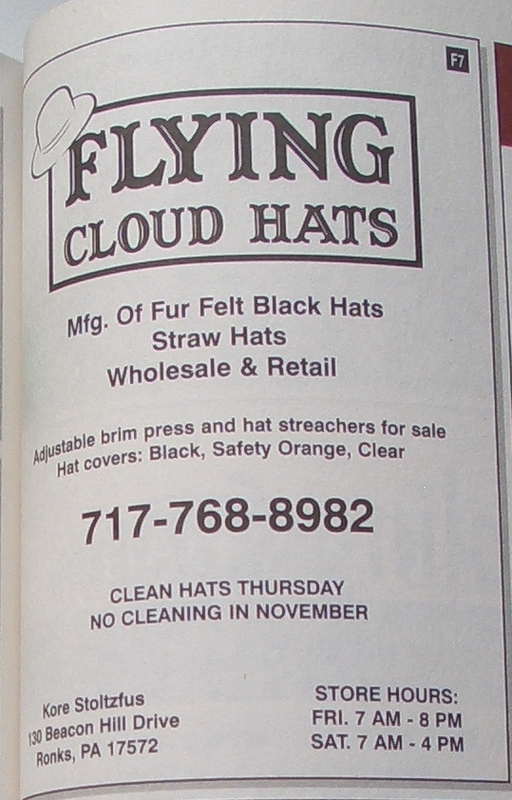 Felt hats with other colors like grey, brown, etc. That’s Ohio Amish right here. We wear the straw hats. I am suffering from a brain tumor, the neuro-surgeon advised me to avoid the sun. Good going, I live in the Tampa Bay Area of Florida. Two years ago,Mohsen I was visiting my mother in NW Pennsylvania, we had dinner in Spartansburg, Pa. We had our meal in an Amish style restaurant that also has a gift shop. I saw a straw hat, perfect for my needs. It is like the straw hats in the photo from Clymer, NY. I wear it everyday, and get many compliments on it as well! I am a Quaker, not a plain dress Quaker, somehow I feel a closeness to the Amish by wearing this hat, after all, the Friends/Quakers and the Amish are part of the Peace Churches. Oops, that should be when, not Moshen, this darned auto correct. I am looking for the kind of Amish straw hat currently being worn by all the Amish men (of all ages) around Nappanee, Indiana (Elkhart County). The brim is not real big, and the hat is grooved down the middle. Sp far I cannot find one on the Internet. Try calling Chestnut Ridge Shoes at 330-893-4020 or Spectors in Berlin, OH, at 330-893-3898. Both carry the black or straw colored nylon hats we like and they come in several crown & brim styles. Do you by any chance have a picture of a prayer kapp from Nappanee? I tried to google it, but all different shapes came up, so I don’t know which one is accurate.